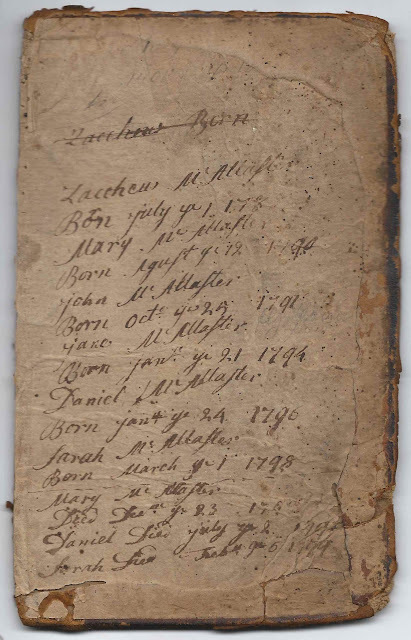 All that I have of the book above, which may have been a Family Bible, is the back cover, the inside of which lists the birth dates of the McAllaster children. I believe them to be the children of Daniel & his first wife Sarah (Russell) McAllaster of Lovell, Maine, though online references have the family as McAllister. Those references show two other sons for the couple, Jeremiah James McAllister and Peter McAllister, both of whom survived to old age. 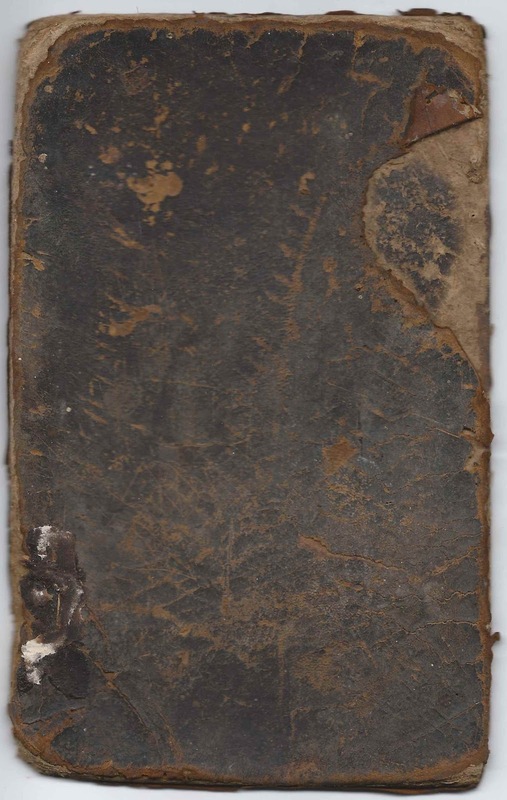 The book may have had a scrap of paper at one time to record the additional births. These dates differ a bit from those in online trees. Zaccheus McAllaster married Tryphosa "Missey" Heald at Lovell, Maine, on 1 October 1811. They had, I believe, ten children. John McAllaster married Lydia Evans at Lovell, Maine, on 17 March 1817. They had, I believe, seven children. The unmentioned Jeremiah James McAllister married Sally Wilson and Mary E. Abbott and had several children with each of them. The unmentioned Peter McAllister married Ruth Elder and had, possibly, eleven children. I don't know how many went on to raise families of their own. If you have knowledge of the McAllaster or McAllister family of Lovell, Maine, please leave a comment or contact me directly. Thanks! Hi...I'm directly descended from Zaccheus and Tryphosa; they are my gr-gr-gr-gr-grandparents. Their daughter Achsah married John Evans, whose daughter Mary F. ["Frankie"] married Charles Doe. Their son Eugene was one of my maternal great-grandfathers. I'm still learning about this branch, so this image was great to come across. Thanks for posting! OMGosh, I can just imagine your excitement at seeing this! Thanks for letting me know and for showing the continuation of Daniel and Sarah's line.